Mrs Crucis and I received a call that will upset my morning routine. We have to go out. We’re invited to breakf…ah, brunch. It was unexpected but never let it be said I turned down an invitation to eat.. There were two acts of rebellion this week. One occurred in Washington…state, that is. The other occurred in Boston—241 years ago. 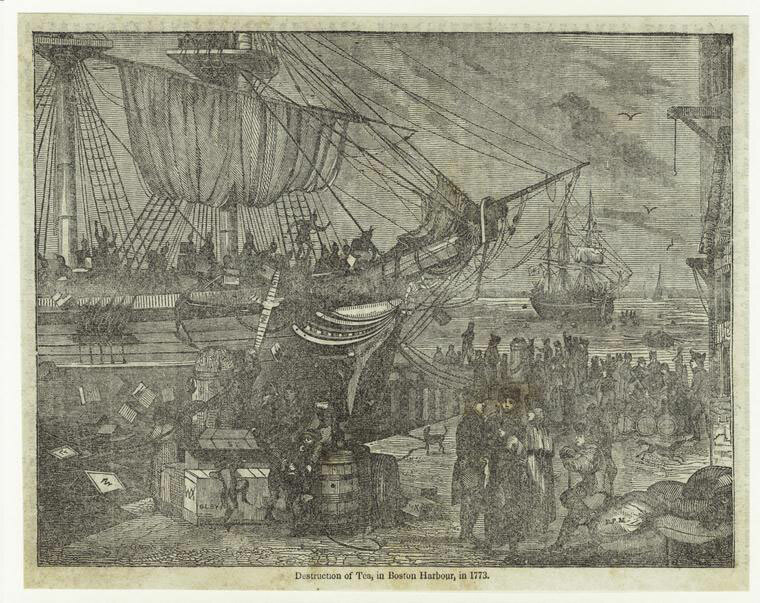 That second act of rebellion is known as the Boston Tea Party. The Boston Tea Party, December 16, 1773. If you look at root causes, you’ll notice that both events were/are driven by the same motivation—rebellion against a corrupt and tyrannical state. In Boston, the root cause of the Tea Party was an act of economic warfare by the British East India company with the compliance of the British government against the growing competition of the American colonies, especially the ship owners of New England. In Washington state, the rebellion is more wide-spread. It is the conservative gun-owners and law enforcement officials against the liberals in control of the Seattle/Tacoma area. The conservatives own the statehouse, less the Governor. Seattle/Tacoma has the larger population and controls the Governor. Bloomberg paid for the passage of Initiative 594 that imposed unrealistic regulations on the ownership and transfer of firearms. The anniversary of the Boston Tea Party slipped by with little attention, if any, from the mainstream media. Their attention was focused on Washington state and the public rejection of I-594 by gun owners and law enforcement across the state. The MSM was watching, but not reporting—unless the Seattle liberal machine tried to enforce their new law at a rally and it blew up in their face. But, the libs backed down and no confrontation, other than in local headlines, took place. Even less attention by the MSM was given to a press release by the Sheriff and Prosecutor of Lewis County, WA. They declared they would not enforce the new I-594 law. Protesters rallied at the state Capitol in Olympia to denounce an expanded initiative on gun-purchase background checks that voters widely approved last month. Alan Berner / The Seattle Times. Above, Sam Wilson, carrying a rifle on his back, waits on the Capitol grounds to address the crowd. You can read the entire artlcle here at the Seattle Times. The Washington state liberals and Bloomberg used the shooting at the Sandy Hook Elementary School as justification. This week, some of the families of the Sandy Hook victims filed suit against Bushmaster and others claiming the AR-15 is a military weapon and unsuitable for civilian use, therefore the sale of such a weapon should be banned. I won’t post a portion of that article, it is just too stupid. You can follow the link and read it yourself. All I’ll say that New England, suffering under liberal oppression, is the only area such a suit has a chance of winning. Manufacturers cannot be held responsible for the use of their products. If that were so, no brewery would now exist in the United States, nor would alcohol be allowed to be imported. The act of rebellion in Washington state was largely ignored outside of Seattle. The Connecticut lawsuit, however, could have wide-spread impact if the families win. Of course it would be too much to expect for them to sue the real culprits, the local school district who chose to allow those students and teachers to be unprotected, exposed and vulnerable to a mental defective and thief. I hate winter! ‘Nuff said. I blogged (yes, it’s a verb!) yesterday about gas prices dropping below $2/gallon by Christmas. I was pessimistic. In thirteen states, including Missouri, that goal has already been reached. Low gas prices is a Christmas gift to us all. I’m a Mark Levin fan. I have most (all?) of his books. I don’t agree with everything he says, but I do believe most. He is one of the stalwarts of conservatism in the country. His Landmark Legal Foundation is in the forefront litigating for our liberty and the retention of our constitutional rights. He also has a temper. Conservative Talk Show host and founder of the Landmark Legal Foundation, Mark Levin. He spoke specifically to Republican promises to defund Obamacare and fight President Obama on immigration amnesty — and the recent failures of GOP leadership to take advantage of the budget dealings with Democrats to do just that. “Do you think you can lie to … conservatives about how you’re going to defund Obamacare, run millions of dollars on ads on that to get re-elected, on how you’re going to fight unconstitutional amnesty? Tooth and nail? You think you can lie to us with impunity? And repeatedly? I don’t care how many millionaires and billionaires you have in your damn back pocket,” he said, Newsmax reported. Mr. Levin then blasted the Republicans for speaking ill of Sens. Ted Cruz and Mike Lee in Politico and other media outlets. Levin’s rant comes on the same day RINO Jeb Bush announced the formation of an “exploratory committee,” i.e., how many donors he can corral. Levin carries a lot of clout. His ‘Convention of States’ continues to gather more support. If another Romney or Bush RINO gets the nomination on 2016, the GOP is dead. Just after Thanksgiving I read an article that predicted gas under $2/gallon by Christmas. I didn’t believe it. My wife told me that price of unleaded regular at our neighborhood gas ‘n grub was $2.149 this morning. That’s down 11¢ since Saturday, the last time I remember seeing a gas price. OPEC’s oil war against our fracking and oil-shale technology continues. The US will cave as soon as OPEC complains to Obama. In the meantime, enjoy the low gas prices while you can. Bloomberg News appears to think this action is negative, limiting spending, pandering to the voters of 2016. On the contrary, I think these Senators heeded the voices of their constituents and their votes should be lauded, not ridiculed. There was a terrorist hostage incident in Sydney, Australia. Five people were shot, two killed including the RIF who started it all. From initial reports, their other person fatally shot was killed by the RIF. The Sydney Police, in another report, admit using live ammunition. Despite claims to the contrary, the GOP establishment pushed through the House a massive funding bill that funded Obamacare and Amnesty. As best that I can find, EVERY Missouri Representative voted for this. They all issued a press release this morning that was almost identical. Every press release was formulated from a common talking point Just compare Vicky Hartzler’s press release with that of Sam Graves, Jason Smith and and the other members of the GOP delegation. They’re almost identical. And every one of them lied! I’m so mad I could bite nails. Let’s term limit the entire Missouri GOP House—replace every one of them. Our Senator, Roy Blunt issued the same platitude. He needs to go, too.